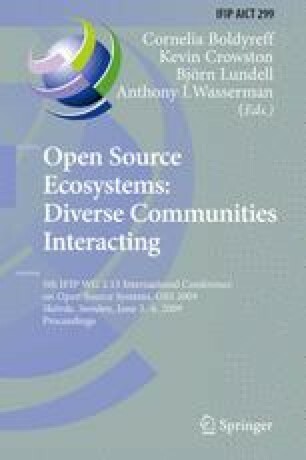 This paper presents work done in the QualOSS (Quality of Open Source Software) research project,which aims at building a methodology and tools to help in the assessment of the quality of FLOSS (free, libre, open source software) endeavors. In particular, we introduce the research done to evaluate the FLOSS endeavor communities. Following the Goal-Question-Metric paradigm, QUALOSS describes goals, the associated questions and then metrics that allow to answer the questions. This work has been funded in part by the European Commission, under the QUALOSS (FP6-IST-5-033547), FLOSSMETRICS (FP6-IST-5-033547) and QUALIPSO (FP6-IST-034763) projects, and by the Spanish CICyT, project SobreSalto (TIN2007-66172).